The FreeMotion Plate Loaded Calf F308 targets and isolates muscles in the foot and calf to develop explosive leg power and build stabilizer muscle strength to protect the ankle joints. The foot platform features textured, non-skip Line-X coating for stable foot positioning throughout your sets. Linear bearings provide smooth, natural reps don't feel machine resistance, only weight resistance. Nickel-plated weight plate storage bars are designed to withstand corrosion, rust and heavy use. The FreeMotion Plate Loaded Calf F308 is designed to provide an intense workout while eliminating strain, the FreeMotion pieces are hard to beat. Easy and convenient step in entry makes getting started a breeze. Equipment is built with 11-gauge steel tubing and is electrostatically powder-coated with paint that has undergone 2,000 hours of salt spray testing. If looking for individual pieces for your Gym check our full range leverage equipment at FitnessZone.com. We are serious about fitness and our customers. Call 1-800-875-9145 to chat with one of our friendly agents at FitnessZone and learn more about the FreeMotion Plate Loaded Calf F308. Order your FreeMotion Plate Loaded Calf F308 from FitnessZone.com today! High-density foam grips provide a comfortable, secure grip throughout every set. The seat and backrest glide smoothly, quietly and without resistance up and down the guide rods. High-density foam padding allows you to sit comfortably with proper back support. Every rep is smooth and natural so the only resistance you feel are the weights, not the machine. The durable steel storage bars are nickel-plated to withstand corrosion, rust and heavy use. Each load bar holds up to 310 lbs. per side (630 lbs. total) and is positioned to facilitate easy entry/exit of the machine. 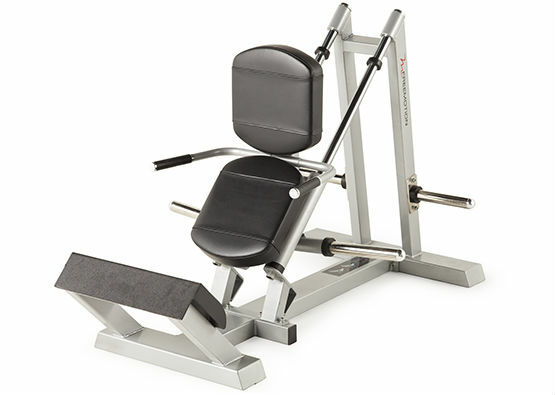 Order your FreeMotion Plate Loaded Calf F308 from FitnessZone.com today!